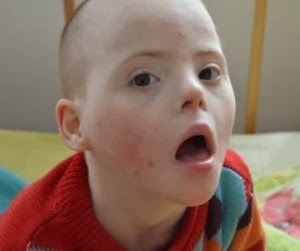 I have decided that, each Wednesday, I will spotlight an orphan from the Reece's Rainbow website that is in desperate need of a family to come rescue him or her. These regular segments will be referred to as my "Weeping Wednesday" blog posts. 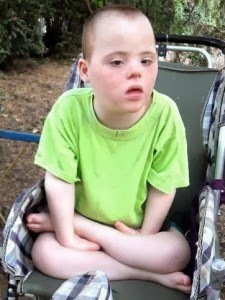 It is my prayer, my hope that someone reading these posts will be moved to action and start praying about adopting one or more of these precious orphans "Because every family deserves the blessing of a child with Down syndrome..." (Reece's Rainbow). I have chosen to spotlight Velia as my first Weeping Wednesday orphan. This precious child was born in August 2000. She has both Down syndrome and Cerebral Palsy. The decision to choose Velia as the first spotlighted child was only natural because I fell in love with Velia over a year ago as I was on the Reece's Rainbow website one night praying for this beautiful organization and ministry and for all of the orphans (as a collective group) on the site. As I was praying, my finger accidentally scrolled across my laptop's mouse pad and Velia's page popped up. Was this just an "accident" that her page came up? No. Was it something more? Yes! The first thing I noticed was that she did not have a Prayer Warrior through Reece's Rainbow's Prayer Warrior Program and it broke my heart. She did not have someone committed to pray for her on a daily basis. How could this be? Velia, a precious child of God, deserved to have someone in her corner falling to his/her knees to intercede on her behalf. So, I realized that the "accidental" swipe of my hand as I was praying for RR was not a mere accident. It was a Divine Appointment to make Velia a part of my life. Therefore, to become her Prayer Warrior, I clicked the link to get signed up. (Click HERE to find out how you can become a Prayer Warrior for a waiting orphan!) Lo and behold, the very next day I got the confirmation email that I was assigned as Velia's new Prayer Warrior! And, believe me, it has been an honor and a joy to pray for her regularly. The second thing I noticed were the two pictures of Velia. These pictures broke my heart as well. She has such a look of desperation and sadness in her eyes. Her eyes are almost empty because she spends the majority of her day confined to her crib crying. This is what someone who has met her said: "She was in an almost empty room, just with another child next to her. She was rocking and gnawing at the bars of the cot and such a sad sight to behold. My heart just collapsed for her!" MY heart collapsed for her! It immediately reminded me of what Maclayne had to endure the first 3 1/2 years of her life before David and I could bring her home. Perhaps this is another reason why I am so drawn to Velia. That was the first time I wept for Velia, my new Prayer Warrior Child. And I will continue to weep until Velia has the one gift every child deserves...the gift we so often take for granted...the precious gift of a FAMILY to call her own. Click HERE to view her page on the Reece's Rainbow website. Better yet, click HERE to vote for her to be one of the featured children in the RR 21 Days of Hope Campaign! If she receives enough votes to become one of the 21 featured children, it could allow her to receive more money for her grant fund!! Friends, readers of my blog, I implore you to join me in sharing Velia's story. Join me in telling others about her. Join me in being her voice! Join me in praying for her on a daily basis. Join me in helping to find her a forever family. Join me in weeping for Velia, the crying orphan. Do not let her cries go unnoticed any longer! Help me silence those tears by bringing her a forever family who will dry those tears through their love! That will change her cries into the most beautiful sound that comes from a child: LAUGHTER!